Since 1999 Thoemmes Press (now Thoemmes Continuum) has been engaged in a large-scale programme of biographical dictionaries of philosophy and related subjects. 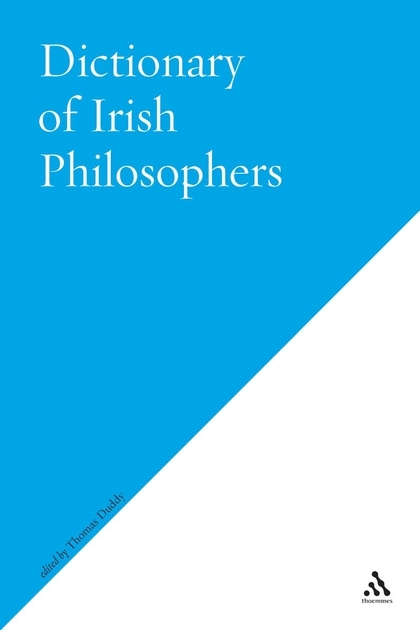 This volume on Irish philosophers follows the standard format of arranging entries alphabetically by thinker. It includes two forms of entry: (1) entries reproduced from previous editions of Thoemmes encyclopedias of British philosophy and (2) wholly new entries on early (renaissance-period) and modern (20th century) philosophers, together with some new entries on the intervening centuries. My new bible! The hardback is going for £175, but I got a copy of the paperback secondhand for $14 including shipping (as of May 2013). The book includes an introductory overview which summarises the history of Irish philosophy from the Irish Augustine up to the 21st century. It also explains the logic behind the inclusions. The idea for the dictionary in the first place stemmed from the difficulty surrounding the Irish entries in the British dictionaries. Thomas Duddy outlines the debate that went on regarding this Irish Dictionary, in which differing definitions of “Irish” clashed, he feeling birth in Ireland was a necessary criterion, another consulting editor M. A. Stewart feeling birth in Ireland was neither necessary (what of those born abroad who had their career in Ireland?) nor sufficient (someone born in Ireland but who had no connection thereafter). Thus the selection of entries involved compromise and excluded several philosophers with more tenuous connections. As with the Thoemmes Encyclopedias an inclusive definition of philosopher, including writers on philosophical subjects whose contribution was small, plus celebrated figures from other domains such as literature, science or mathematics, who had made philosophical contributions. There are entries on “over 180 philosophers”, with no entries on any living person. The selection includes all the well-known names, medieval philosophers, forgotten scholastics and academics. Where works by the subject have been published a bibliography is included, along with further reading.